GREAT FOR THE PRICE: This Custom X bodyboard offers all of the features that you would expect to find in a high end bodyboard. This board is very moderately priced and for the money you pay, it has great value. HOW YOU CHOOSE TO RIDE IT IS UP TO YOU: What makes this board so special is that it can be used as a prone bodyboard and a drop-knee bodyboard. It offers stiffness in the places where you need for drop-knee boarding and control and speed for when you are prone bodyboarding. WELL MADE AND HIGH QUALITY: High-grade Surlyn Slick bottom with channels. 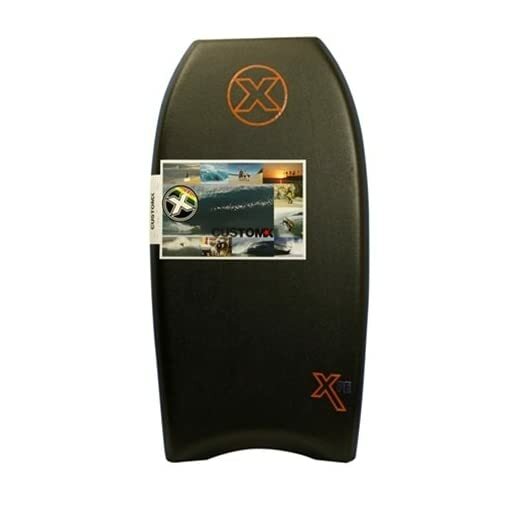 Surlyn plastic is regarded as the top of the line material for any bodyboard slick. Great for any level of experience. Wave-Plank Polyethylene Core. These boards aren’t going to wear out. They are made for everyday, frequent use.